The author copies of which just arrived at the Scalzi Compound. They look fantastic. Speaking of Fuzzy Nation, I wrote about it (and its relationship to fan fiction) today for the Tor newsletter, so if you subscribe to it you should have it in your e-mail queue. If you don’t subscribe to the Tor newsletter, well, first, shame on you. But, also, here’s an online version of the article. 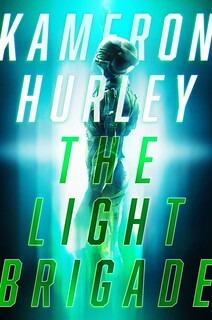 And yes, I will give away a copy of the hardcover before the end of the week. Not today, though. I’m crazy busy today. Athena’s ‘rock ‘n roll’ face is spot on. Epic stance for, what I’m sure is, an epic book! Complete side note/question: Where can I get that Portal shirt?? My stepdaughter would love that. I cannot wait to see what devious scheme you’ve cooked up to determine the next recipient. Athena needs to handle all your PR from now on. a) I was wondering the same thing as #3 about the Portal shirt; b) Waaaait…WHAT is on that poster in the upper left corner? We got the Portal shirt at a science fiction convention. I’m not sure where/if it’s available online. However, there are many cool Portal-related shirts at the official Valve store. The t-shirt appears to be available here. I think a better title for this post is “Look at Athena’s New T-Shirt.” I didn’t get the Portal reference, and was going to ask if real science was involved. Athena looks like Sue Heck from The Middle. I’m assuming this is her room, or are you a secret member of Team Jacob? My guess is that photo was taken in Athena’s lair. Scary, isn’t it? My two daughters contructed shrines to A.J. McLean and Orlando Bloom, respectively. Bloom I encouraged; McLean not so much. 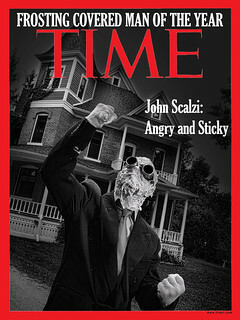 Dave @15 – I realized that wasn’t John’s office about a half-second after I posted. ::facepalm:: (It also looked like some sort of “Demotivational” poster/Twilight spoof, in which case, I really *did* want to see it.) At any rate, my daughter’s read those books, too – although they’ve never earned the multiple-re-read status of the Potter series and “Zoe’s Tale” – and I still think she’s cool. And as far as fan fiction goes, my favorite implied license comes from CJ Cherryh’s Merovingen series, which started with one novel, and seven shared world anthologies, with each book having an extensive index detailing climate, ecology, politics, history, etc. Rock on, Fuzzy Nation. Rock on. Once again, Athena demonstrates that when she’s goofing around she looks like John and when she isn’t she looks like Krissy. Well OK, she’s only demonstrating the first half of that here. When you start giving away your author copies, don’t forget those of us in time zones outside the US who got totally shafted on the last ARC giveaway. After all, you’re coming to Germany in a few months and you don’t want your fans here to think you don’t like them. 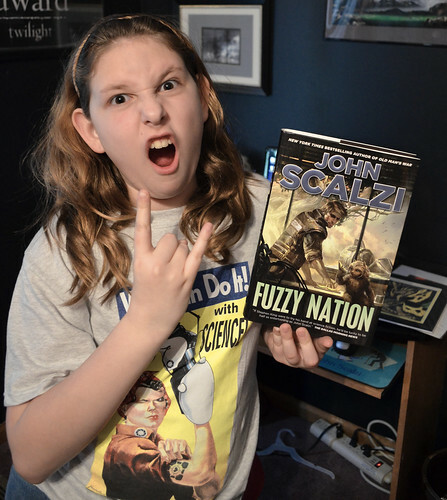 Scalzi, you have got one cool daughter. And oh, I’m sure the book is great too! I got her clearance before I posted it. She has only herself to blame.